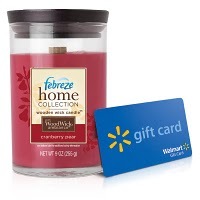 Are you the Walmart gift card WINNER?! Christmas shopping has already begun in my house. Truthfully, it began this summer when I found a train table for my son at a garage sale for only $10! He's all into Thomas, so Christmas morning is going to be pretty exciting around here! I'm sure many of you have begun your shopping, too! Someone is going to be happy to have a little extra moola to spend on someone on their list! Commenter #16, MARCI, has won the $15 Walmart gift card from Febreze and MyBlogSpark. Marci, I've emailed you with instructions to claim your prize! Check your inbox! 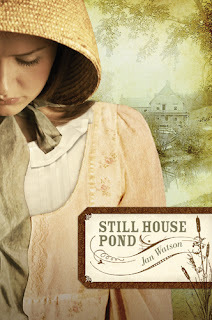 I really wanted to like Still House Pond by Jan Watson, but I just couldn't get into it. Although Still House Pond is supposed to be a standalone novel, I felt like I'd tuned into a Walton's episode a half hour too late. Since I haven't read Jan's Troublesome Creek series and that's where many of the characters were first established, I felt a little lost. I did enjoy Jan's style and the 'Walton's' feel to the book, so I think if I was properly introduced (by reading mama Copper's stories ), I may be able give Lilly and Still House Pond a fresh start. Just take a walk through your local grocery store, and you'll see that all of the holiday baking supplies are prominently displayed. 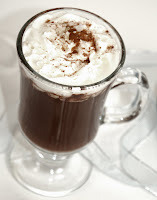 Well, time to make some hot cocoa, pull up your stools, and start jotting down some gotta-make-this-year recipes! Start with this one! It REALLY is the yummiest, creamiest hot chocolate! The mix fills a large gallon sized bag (approximately 50 servings) and, although we seemed to drink it all the time, it lasted my husband and me months! Combine all ingredients in a bowl and stir well. For a better blend, mix the dry ingredients in a blender or food processor before adding the marshmallows. Store the mix in an air-tight container. Makes about 12 1/2 cups mix, for 50 servings. To serve, place 1/4 cup mix (or more) in mug or cup. Add 3/4 cup boiling water or hot milk and stir well. Once you've done that, check out my other holiday recipes! I can't believe it's that time already, but I’ve already begun planning for our family’s Christmas card. Along with a short note of our yearly happenings, I love to include a recent photo of my kids. I mean, aren't Christmas cards the perfect time to show off your adorable munchkins? 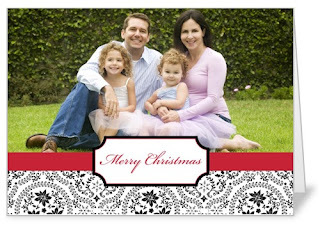 Shutterfly has a beautiful assortment of photo Christmas cards to choose from! You’ll have a hard time deciding! Not only do I love the simplicity of Fresh Lemonade's design, but my favorite part? The inside of this card has space to include extra photos and a short note about each member of the family! Just what I love to include in my cards! I really can't say enough about Shutterfly. I love the pictures and photo books I've ordered from them in the past! I know you would be pleased with your Christmas cards, too! Be sure to check them out...! CFBA introduces another title this week: Head in the Clouds by Karen Witemeyer. Like Karen's debut novel, A Tailor-Made Bride, I really enjoyed the cover of Head in the Clouds. Or, should I say the BACK of the cover. ;-) You can see Adelaide's foot and book in the air and she trips off the porch. Certainly portraying a girl with her head in the clouds! Although that's the cover and title, I didn't think Adelaide was really that oblivious! She seemed quite smart and composed, with a cheerful disposition and active imagination - she just had a fairytale vision of Prince Charming - and who doesn't after reading Jane Austen? I would have enjoyed Head in the Clouds better without Jose's part, as Uncle Petchey is enough nasty scoundrel in the story for everybody. Although Gideon and Adelaide play out a fairly obvious prairie-western love story, Head in the Clouds was an enjoyable kids' naptime read. Thank you to Karen and Bethany House, through CFBA, for sending me a review copy! This week, CFBA is introducing The Preacher's Bride by Jody Hedlund. I didn't quite know what to think when I first started reading Elizabeth's story. Most parts I liked, some parts I particularly didn't - like too much mentioning of eyes-raking-over-bodices. I read so many books, that a story really has to have something unique to hold my attention. The time period was also a bit difficult for me to get into. It wasn't quite like this (although close! ), but I just kept imagining a medieval town with dirty, raggedy villagers and evil villains terrorizing woman and shooting flaming arrows into thatched roofs. Not generally something I enjoy reading. However, when I finished The Preacher's Bride and read the Author's Note, my mind started leaning more towards liking the book. Jody was inspired by the true story of John Bunyan and his wife, Elizabeth. While I can't vouch for the historical accuracy, it did change my feelings toward the story. I would have actually preferred a little more clarification on John and WHY he and his family were persecuted. All I really got was that he was an unlearned man, preaching the gospel - seen as illegal in that day and age. Regardless, I know many men and women have taken a strong stand on what God's Word says and died for their faith (for more or less reasons than being an uneducated preacher). I don't believe there are many today who are truly willing to die for the Lord. Most are much more willing to compromise. Overall, The Preacher's Bride was an interesting look into what 17th century Christians may have suffered to hold true to their beliefs. Thank you to Jody and Bethany House, through CFBA, for sending me a copy to read and review!